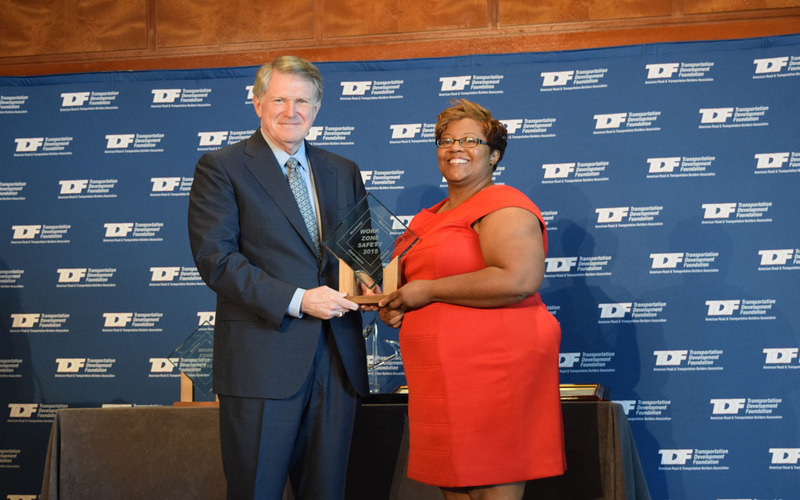 Kimberly Sims, 35 Express Public Information Manager (right) accepts Work Zone Safety Award. ARTBA’s 17th annual “Roadway Work Zone Safety Awareness Awards” has recognized five efforts to reduce roadway work zone accidents, injuries and fatalities. Winners were announced Sept. 30 in two categories: Outreach Campaigns, which include employee and/or public education promotions on a national, state or local level; and Innovations in Technology, which recognize the important role that technology plays in improving safety in and around work zones. The winners accepted the awards during a special luncheon at the association’s annual national convention, which continues here through Oct. 1.